In some developing countries, this is all it takes to restore someone’s sight and significantly change their future. A dollar for each meter you climb up. $297 pay for a school eye screening camp for 150 students in the Philippines. $888 will fund a community eye screen camp for over 500 people in a village in Cambodia! One dollar for each step and you will pay for 6 months training for an Ophthalmic Nurse in Vietnam. I will take on the Eureka Stair Climb challenge on Sunday, 17 November and STEP UP TO RESTORE SIGHT! 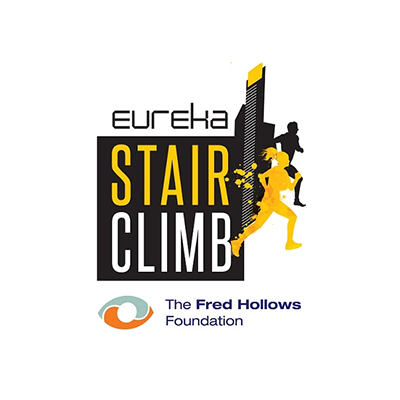 This is Australia’s BIGGEST stair climb - 88 floors and 1,642 steps to the top of the Eureka Tower in Melbourne and I'm climbing to raise money for The Fred Hollows Foundation. Over 25 million people are needlessly blind on this planet but a simple procedure for as little as $25 can restore their sight and change their lives. Please support my climb by donating generously.